Can Cavs Make Playoffs Without LeBron James? A few months ago the Cleveland Cavaliers were contenders. Then LeBron James – and his 27.2 Wins Produced– left for Miami. And even though Daniel Gilbert promised a title in Cleveland before LeBron and the Heat win a championship, NBA observers expected the Cavaliers to be much worse without King James. the Heat aren’t that good. Daniel Gilbert might be right. Okay, the Heat’s record is a bit of an illusion. 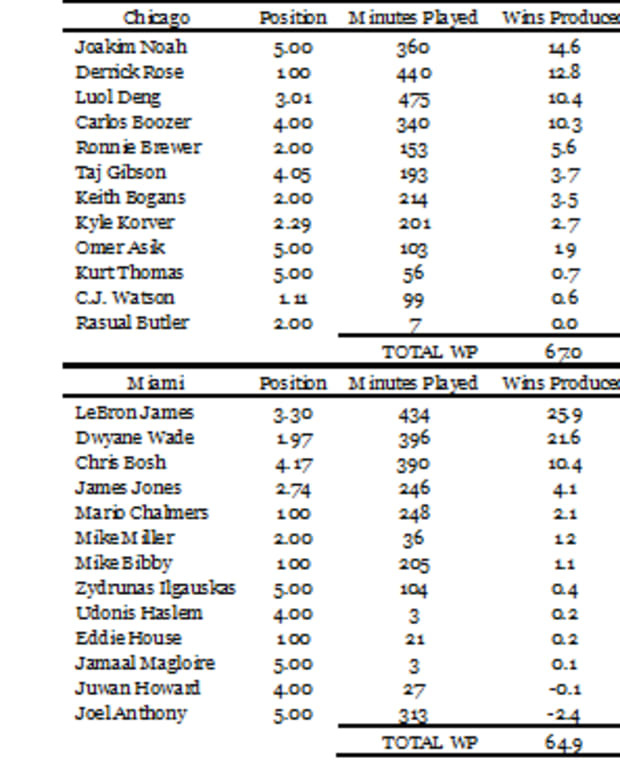 Miami actually has an efficiency differential (offensive efficiency minus defensive efficiency) of 11.6. Such a mark is identical to the mark of the 1996-97 Chicago Bulls and second only to the 13.0 mark of the 1995-96 Bulls. Yes, the Heat have been very good. And this has been achieved without Mike Miller (so the Heat could get better). Just like the Heat, the Cavaliers record is also a bit of an illusion. 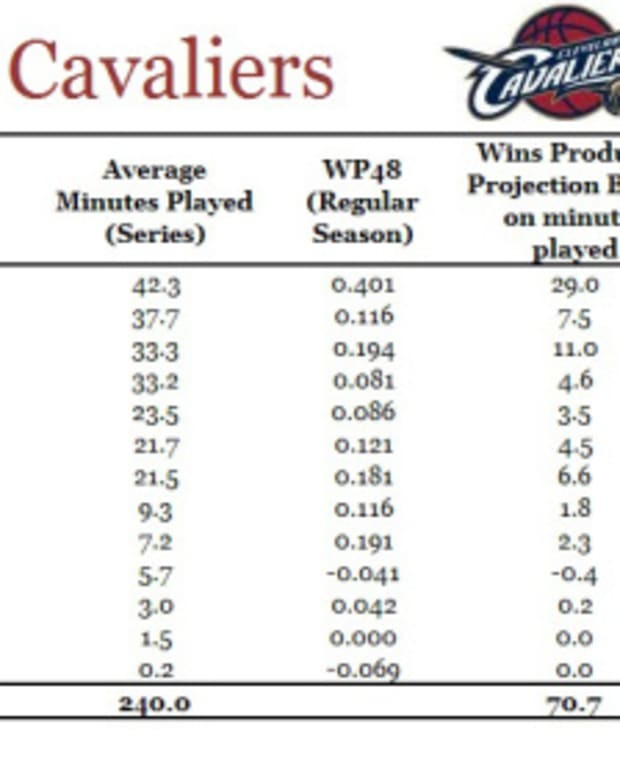 Unfortunately for fans of the Cavs, the won-loss record actually overstates how good this team has been. Currently the Cavaliers’ differential is -2.8. Such a mark is consistent with a team that will win about 34 games across an 82 game season. And that mark currently ranks 10th in the Eastern Conference. So although the Cavs would be in the playoffs if the season ended today, the team’s efficiency differential (a better predictor of the future than won-loss records) indicates this team will not be in the playoffs when the season ends. Of course, that assumes that what we see after 10 games continues the rest of the season. And of course, players can get better (and of course, they can also get worse). As the season unfolds we will see who gets better (or worse). 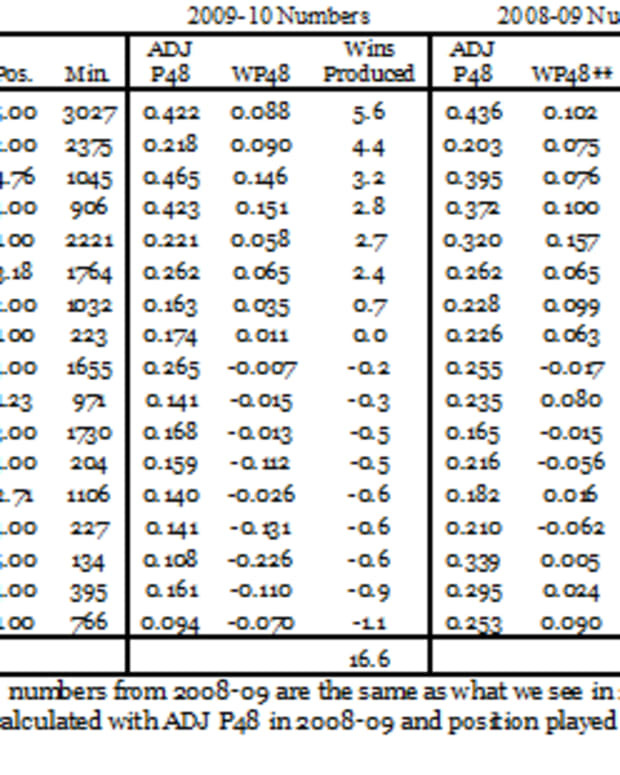 For now, though, let’s move from efficiency differential to Wins Produced. As the following table indicates (and these are my handcrafted numbers), the Cavaliers currently have five players – Daniel Gibson, Jamario Moon, Anderson Varejao, Antawn Jamison, and Ryan Hollins – who are above average (average WP48 – or Wins Produced per 48 minutes – is 0.100). Relative to last year, two of these players – Gibson and Hollins – are performing quite a bit better. 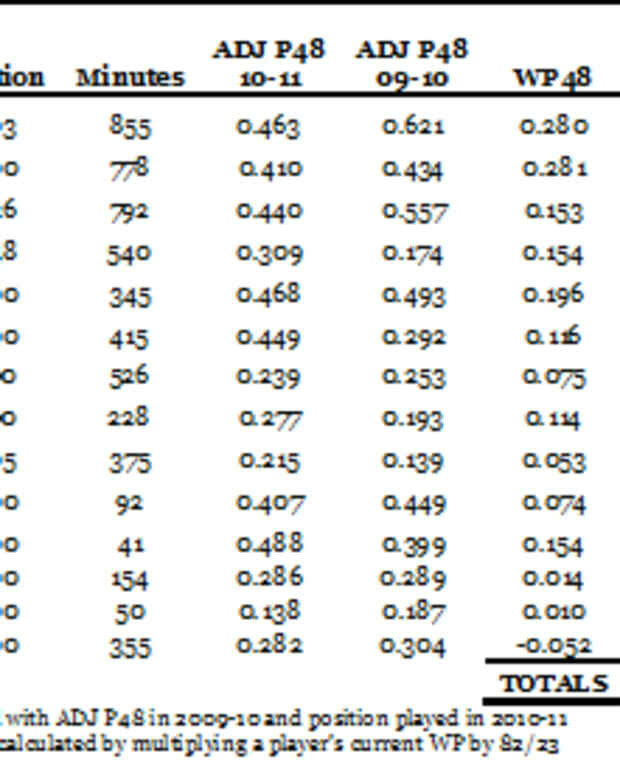 In fact, Hollins was the second least productive player in the NBA in 2009-10. So Hollins producing at an above average rate (okay, 0.102 is only slightly above the 0.100 average mark – but this is Hollins, so cut him some slack!) is quite a bonus. Unfortunately, Hollins entered this season with 2,384 minutes of NBA experience and he had never posted numbers for a season in the positive range. Gibson has been consistently been in the positive range. But in 5,616 minutes of NBA experience Gibson had never had a season where he was above average. If both Hollins and Gibson revert to form, then the Cavaliers will decline across the remaining 72 games this season. Even if that doesn’t happen, though, the Cavaliers have clearly declined from last year. Going forward it’s clear what this team needs. It is difficult for a team to contend when its most productive player posts a WP48 mark that is below 0.200. 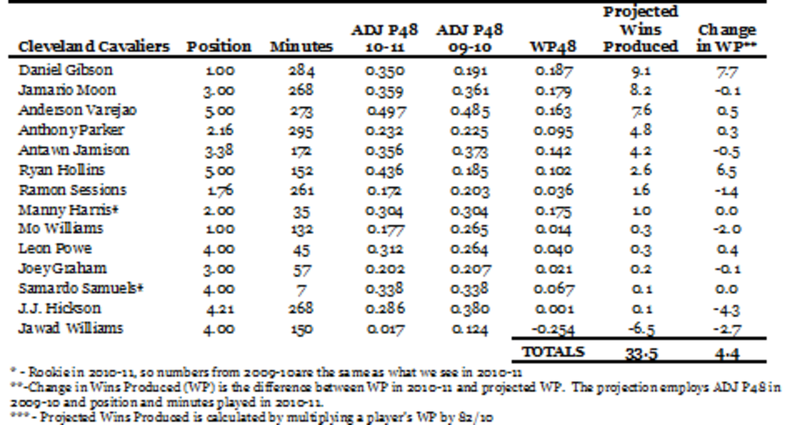 If your most productive player offers so little (and Gibson’s WP48 is only 0.187 and he is on pace to produce just 9.1 wins), all of the remaining players on your team have to average a WP48 of 0.141 for the team to win 60 games. The Cavs do have five players who exceed this threshold. But the team also has eight players who do not reach this level. 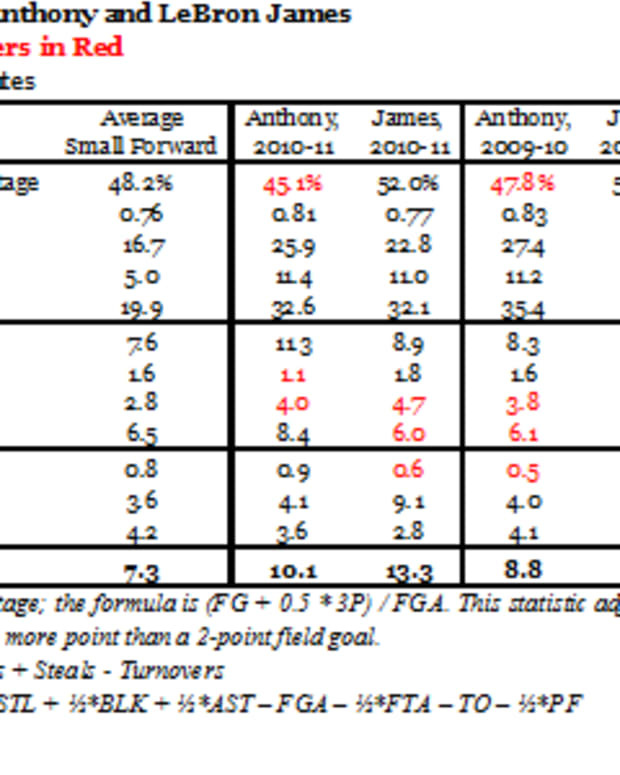 So going forward, the Cavaliers could find a whole collection of players who can produce at an above average rate. Or the team can find one player (or maybe two players) – like a LeBron James – who can produce at a rate beyond 0.300 or 0.400. Until either happens, the Cavaliers are not going to contend for a title. And the odds are, Gilbert will continue to be wrong about Cleveland’s chances to win a championship. P.S. If you want to see Wins Produced numbers for every team, check out the WP numbers from Andres Alvarez. These numbers are being updated every morning. And check out all the blogs in The Wages of Wins Network for additional stories on the NBA. 2011 NBA Playoffs: Can Bulls Really Beat LeBron, Heat? Can New Jersey Nets Make Playoffs in 2010-11?